LT-GEN ROBERT BADEN-POWELL Newsprint Portrait Signed. 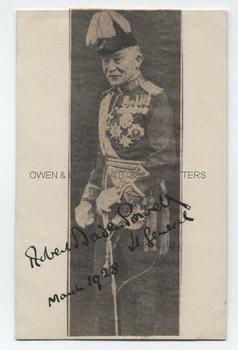 Newsprint photographic portrait mounted on post-card and with autograph full signature and date "Robert Baden-Powell Lt. General. March 1928" written boldly across image and mount. The newsprint photograph shows Baden-Powell full-length, in plumed hat and wearing dress uniform, displaying military decorations and honours. The 70 year old general retains an erect military bearing despite his advancing years. Robert Baden-Powell entered the army in 1876. He achieved national acclaim when he led the successful defence of the seige of Mafaking in the Second Boer War of 1899. He will always be remembered, however, as the founder of the Boy Scout movement, which he launched in 1907 following the first Scout Camp at Brownsea Island.